Room 2123 of the Rayburn House Office Building was packed like a sardine can. Broadcast news cameras, bloodthirsty journalists, hopeful business owners and loyal admirers aimed their sites directly on one man – Joe Sugarman. Most men would cower under the intensity of this hearing, but not Joe. He had the truth on his side. Joe had spent two exhaustive years gathering evidence to prove how the Federal Trade Commission had unjustly attacked his catalog company, JS&A. Besides, the subcommittee was so focused on assaulting Joe that they failed to realize the irony projected on the screen behind them. On display was a humorous, hand-drawn image of a big, hairy monster named ‘Bureaucracy’ squeezing the life out a silly depiction of Joe. “Mr. 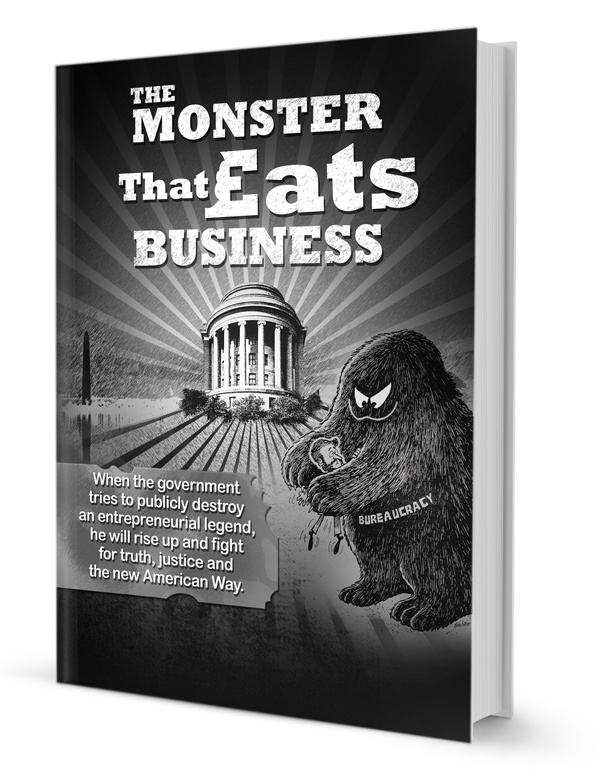 Sugarman, do you feel this comic book, ‘The Monster that Eats Business’ created and distributed by you, accurately portrays the FTC’s treatment towards you?” demanded Dingell with his guttural voice. Laughter and ruckus erupted again. After hours of the committee pounding him like a meat tenderizer, Joe felt a sense of relief. He had almost forgotten what that even felt like. However, Dingell was not amused; nor were his fellow congressmen sitting on the three-tiered benches. They looked like a bunch of street thugs wearing three-piece suits out for blood. Yet there was one committee member, Congressman Al Gore, who clearly stood apart from the pack. “You are referring to a little snowstorm in Chicago two years ago?” sneered Mike Synar, the thirty-year-old congressman from Oklahoma. Joe wasn’t exaggerating. The snow and ice reached such high levels that children were seen sledding from their second floor bedroom windows. It would take a week before any employees could even reach the office. To make matters worse, the main computer that processed all the mail orders had a total meltdown. The double whammy made it impossible to ship any customers’ orders out in time. However, against all odds, he did manage to send out delay notices, with one minor mistake. A few words were placed in the wrong section of the letters as laid out in a brand new FTC rule. And for that, he got slapped with a $275,000 fine! In 1981, that was ludicrous. In fact, it was ludicrous for any year! Joe then looked towards the congressional benches and noticed Al Gore giving them both a knowing nod. Just yesterday, Jere and Joe sat in Gore’s office. During their visit, Gore couldn’t have been nicer and more sympathetic to Joe’s cause. Every word, every gesture from Gore helped Joe feel more and more optimistic. Gore promised Joe that the committee would be ‘fair and just’. “Thank you, Congressman Gore,” replied Joe. Finally, the game was afoot. Wait, what? Did Gore just use the copy from one of Joe’s advertisements as a testament to Joe’s character? This was not ‘fair and just’ – it was just not fair! Joe almost fell out of his chair. This couldn’t be any further from the truth and Gore knew it! Two years of turmoil flashed through his mind. The public slander from government officials trying to destroy his good name. The threats on his livelihood from faceless FBI agents. The endless hours of battle preparation that took him away from his family and now crippled his business. But now, more than ever, he was determined to make it all count for something. From coast-to-coast three thousand petitioners, comprised of citizens, senators and even business enemies, signed their names to give Joe his day in court. Joe was no longer fighting for just his business, he was now fighting for all the small businesses across the United States of America. Joe slowly rose from his chair, “Congressman Gore. First of all, everything you mentioned has been taken out of context. I have never said that we were perfect even though we had one of the lowest complaint records in the country for the volume. However, I did say that the whole basis of why I am here, why I fought so hard to be here, is to determine what criteria the FTC used to select JS&A – something the FTC still refuses to tell me. “Mr. Sugarman, please sit down,” said Gore.